Ralph A. Johnston. Image available on the Internet and included in accordance with Title 17 U.S.C. Section 107. JOHNSTON, RALPH A. (1899–1966). Ralph A. Johnston, oilman, son of Reuben Jefferson and Elizabeth (Gilbreath) Johnston, was born on December 31, 1899, at Albertsville, Alabama. He grew up and went to school in Okemah, Oklahoma, enlisted in the United States Army during World War I, and from 1918 to 1922 attended the University of Oklahoma, where he majored in geology. From the time he finished school he was involved in the oil business, first in Oklahoma and then, for the remaining thirty-five years of his life, in Houston, Texas. In 1931 he was operating as an independent oil producer with offices in Houston. 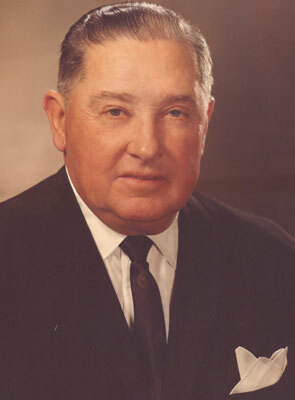 He was chairman of the board of the Texas National Petroleum Company (until it was bought by Union Oil Company of California), of the South Coast Life Insurance Company, and of the University Savings and Loan Association; he was also a director of the University State Bank of Houston and the Security State Bank at Pearsall. He had extensive ranch operations in Medina, Frio, and Madison counties, was a director of the Texas and Southwestern Cattle Raisers Association, and was a trustee of the National Cowboy Hall of Fame and Western Heritage Center at Oklahoma City. Johnston, who amassed a fortune as an oilman, insurance executive, banker, and rancher, devoted much of his time to ensuring the growth of Houston. He was a moving spirit in the affairs of the Houston Livestock Show and Rodeo and served as its president from 1951 to 1954. He helped acquire the land for Houston Intercontinental Airport and turned it over to the city at cost, knowing that increased air traffic was an important factor in Houston's growth. Johnston was married to Merle May on November 5, 1927, and they were divorced in 1961; they had two children. He was married again on February 9, 1962, to Dolores Franklin Jones, a widow with one son. Dobie Paisano Ranch. Courtesy of the Portal to Texas History. Image available on the Internet and included in accordance with Title 17 U.S.C. Section 107. In 1962 Johnston endowed a laboratory at the Baylor College of Medicine, and before his death he established the Ralph A. Johnston Foundation for charitable purposes. He was a longtime friend of J. Frank Dobie, whose last book was dedicated to Johnston and Walker Stone, editor in chief of the Scripps-Howard newspapers; after Dobie's death Johnston bought Paisano Ranch from the Dobie estate to take it off the market. Dobie's friends wanted the ranch to be preserved as a cultural retreat for Texas writers and artists, and although Johnston offered to underwrite the whole project, funds were raised at an auction of paintings by leading artists of the Southwest at a gala dinner held in Houston on May 11, 1966. Johnston, in addition to donating at the auction, had already contributed 10 percent of the original purchase price of the ranch, plus all legal fees, interest, and interim costs. His was the greatest single contribution to the preservation of the ranch, and the Ralph A. Johnston Foundation continued to provide annual fellowships for residents of Paisano. One of Johnston's last acts was to sign the deed transferring Paisano Ranch to the University of Texas at Austin, with strict provisions for its use as a retreat for writers and artists. Johnston died on August 8, 1966, and was buried in Forest Park Cemetery, Houston. Cattleman, September 1966. Joseph L. Clark, Texas Gulf Coast: Its History and Development (4 vols., New York: Lewis Historical Publishing, 1955). Vertical Files, Dolph Briscoe Center for American History, University of Texas at Austin. Handbook of Texas Online, Eldon S. Branda, "JOHNSTON, RALPH A.," accessed April 24, 2019, http://www.tshaonline.org/handbook/online/articles/fjo37. Uploaded on June 15, 2010. Modified on April 12, 2017. Published by the Texas State Historical Association.